"One of the most adroit, hilarious satires I've seen in a long time." "This is a shining jewel in this genre's crown." "The hero of the story...may talk like Sam Spade but the issues he confronts, the possibility of altering genes with brain chips, comes straight out of the digital age." 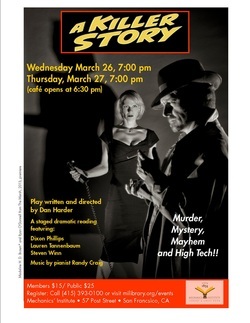 A Killer Story is a fast-paced, noir-style detective play about passion, beauty, art, artificial intelligence, neuroscience and the incredible power of stories. Come see the show Thursday, Friday & Saturday nights at The Marsh Arts Center in Berkeley, California.